One of the most difficult things to do with a decent AV or Cinema system is to properly intergrate a reference level hi-fi for critical listening. 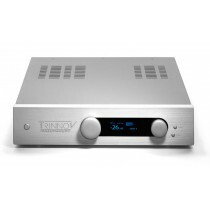 This range of high quality hifi products gives you that intergration. HT Bypass or Home theatre-bypass is a stereo RCA jack input on an integrated amp or pre-amp that hooks up with the main left/right pre-outputs on your A/V receiver. When you select this input, the signal will bypass the pre-amp’s gain controls, letting you use your integrated amp purely as a stereo amplifier without having to worry about adjusting volume when watching movies—the receiver’s own volume control takes over that function. Then, when you select other components connected to your integrated amp, such as a turntable, CD player, or external DAC, its volume control will operate normally.